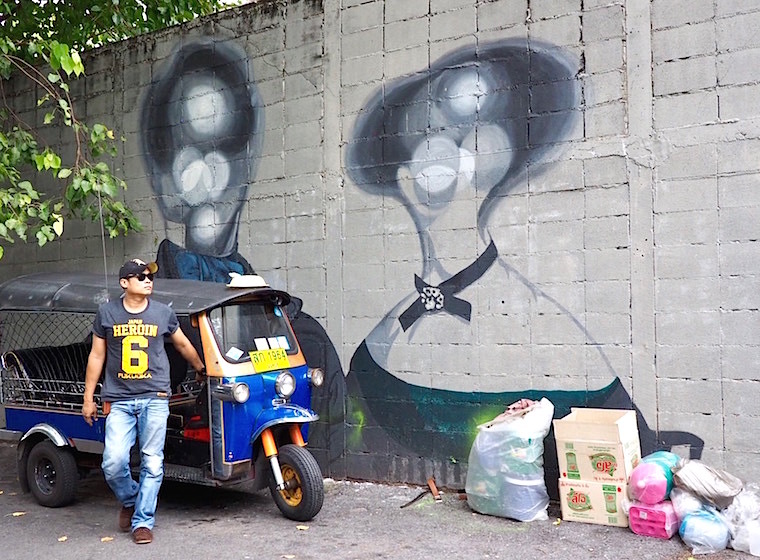 My search for street art in Bangkok almost ended before it started – have you seen the size of Bangkok? It’s huge. 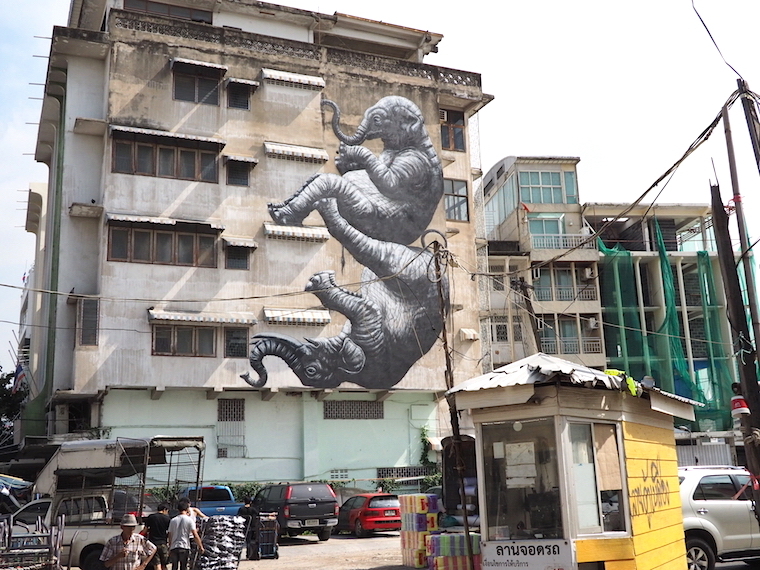 Luckily, a little research uncovered the BUKRUK II Urban Arts Festival, an event held in January that pulled in big-name artists from across Asia and Europe – and gave me a solid place to start. It looked like a pretty epic gig too, with exhibitions, artist talks, workshops, food markets and even its own music festival taking place during the 10-day run. I’m gutted I missed it, not least because the organisers seem to be giving themselves an extremely healthy gap between events – about three years, by last reckoning. 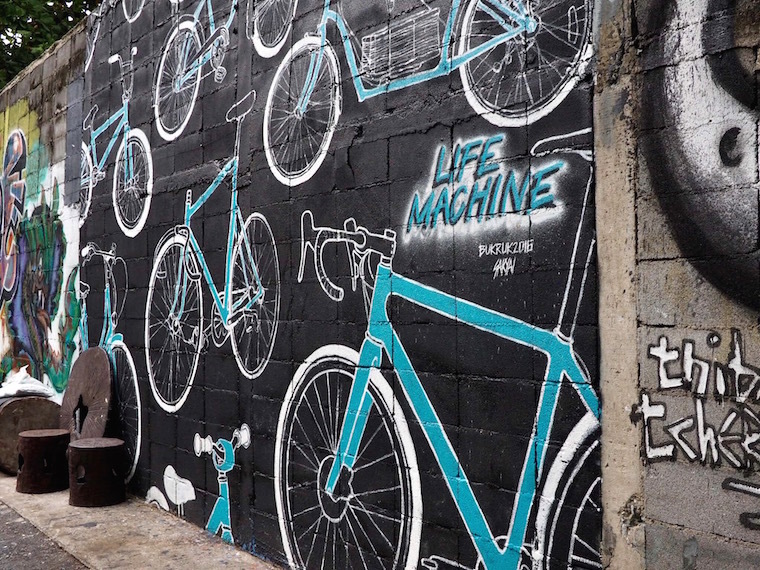 However, the great thing about street art festivals is that their legacies get to live on long after the artists have packed up their spray paints and left town. 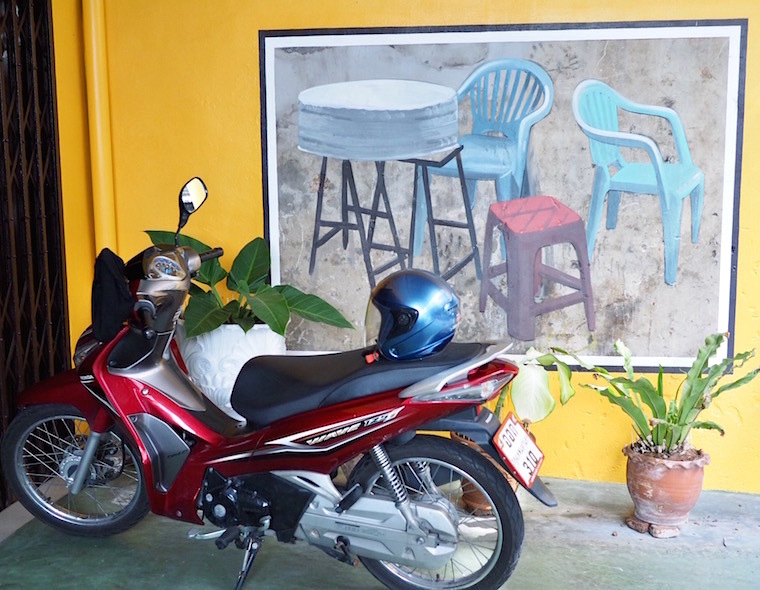 So, with a handy map swiped from the website, I headed down to the Bang Rak area of the city in search of some artwork. 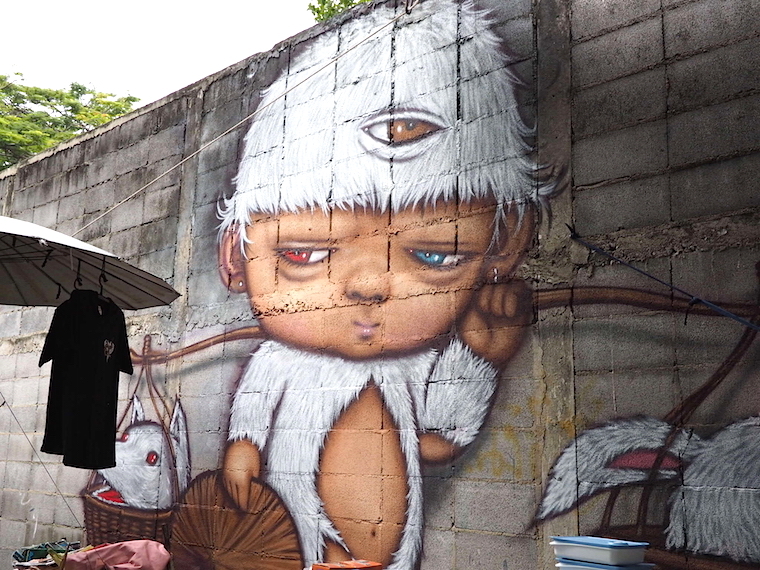 The best concentration of murals is along Charoen Krung Soi 32, a dead-end alleyway off the main road. It’s home to a pretty lively market so it can be tricky to see some of the artwork. But it’s great that these murals are in such a heavily used area rather than being hidden away or kept separate. It’s part of the community now. I love this one, painted by homegrown female artist Phai. You do not want to mess with this chick. 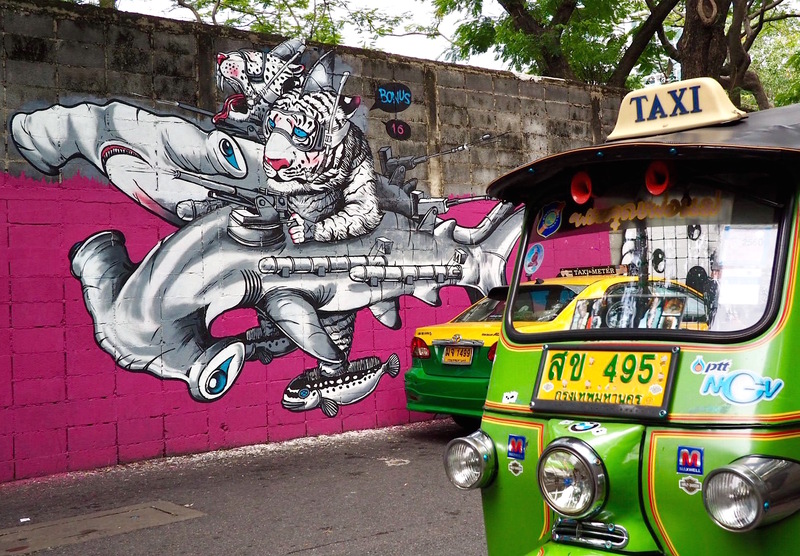 And how cool is this tuk-tuk driver? He almost (almost) steals the show from Kult’s unsettling faceless people. Bonus TMC answers the age-old question: what would it look like if tigers could ride weaponised hammerhead sharks? 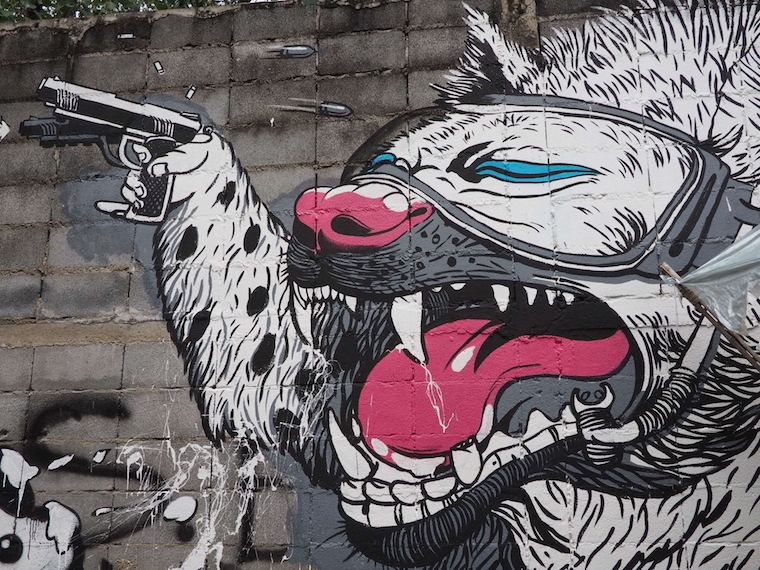 He also created the mural in the first photo of a big cat with a gun. There seems to be a theme here, no? ALEX FACE is HUGE in Thailand. I’ve seen his Mardi the Bunny character (a streetwise baby in a bunny suit) so many times it feels like a familiar friend now. There’s a nice story behind it too: the Mardi character is based on the artist’s daughter, who arrived in the world looking intensely thoughtful. 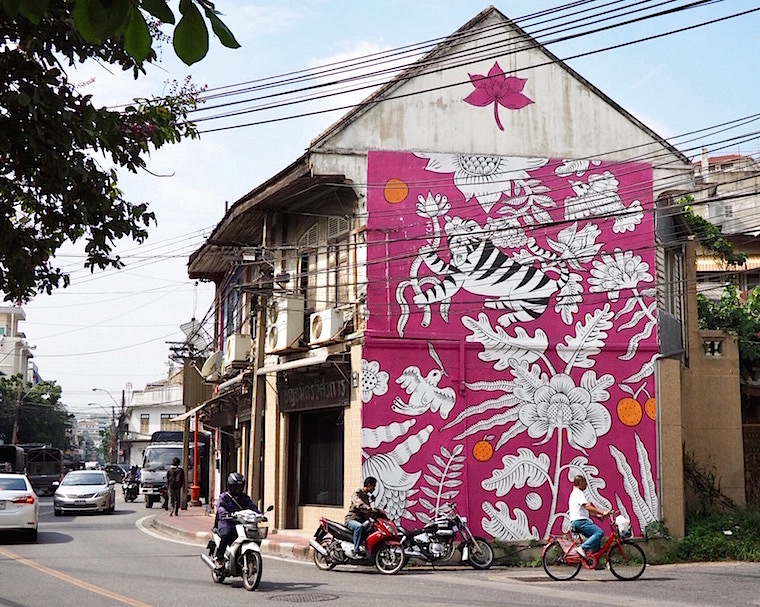 The Thai artist started to imagine what she was stressed about and took it from there. 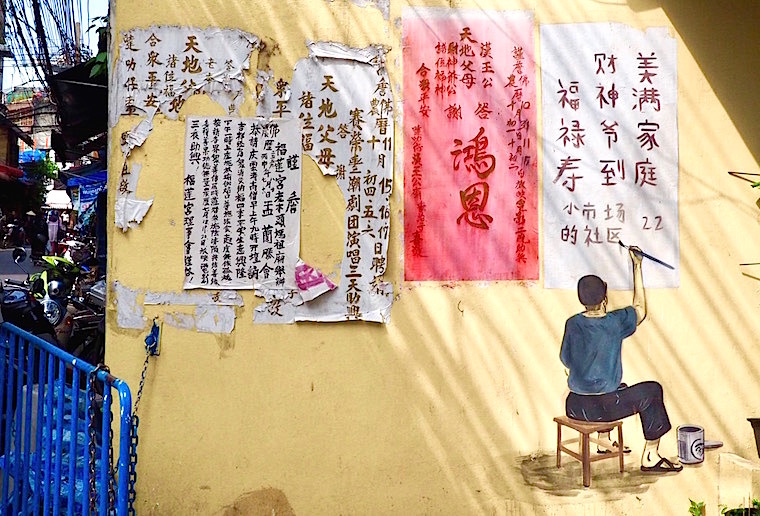 When you’ve had your fill of the artwork along here (and maybe bought some street snacks to keep you going) you can start following the trail towards Talat Noi on the outskirts of China Town. 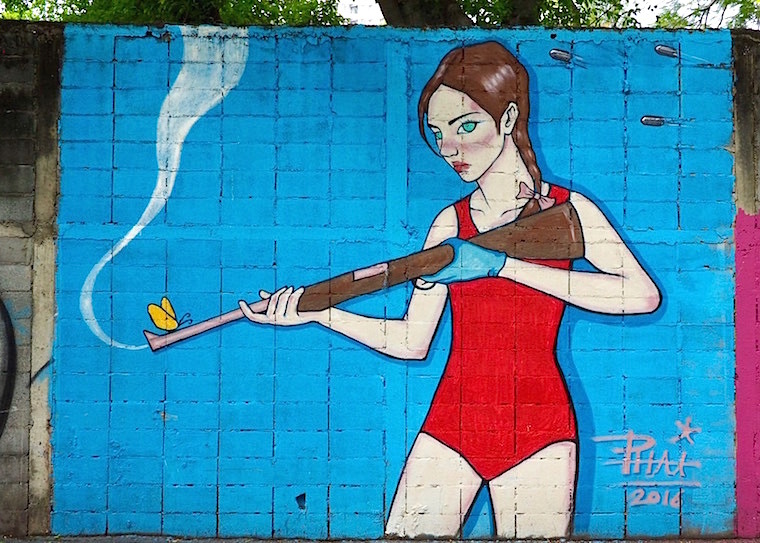 You know you’re on the right path if you come across this glorious mural by Romanian artist, Aitch. You should see some of the illustrations on her website – she’s worked with some pretty big brands. 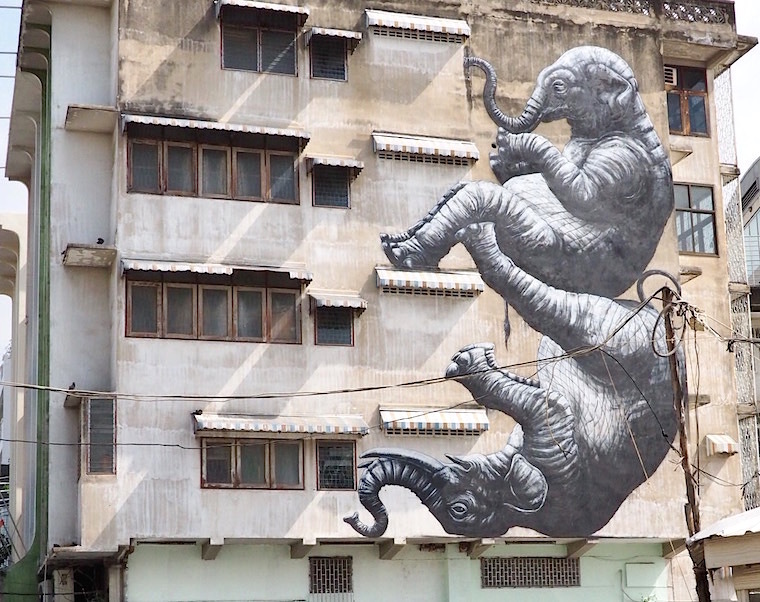 And (drumroll, please) my favourite of the whole lot – these intricate elephants by Belgian artist ROA. Total masterpiece. 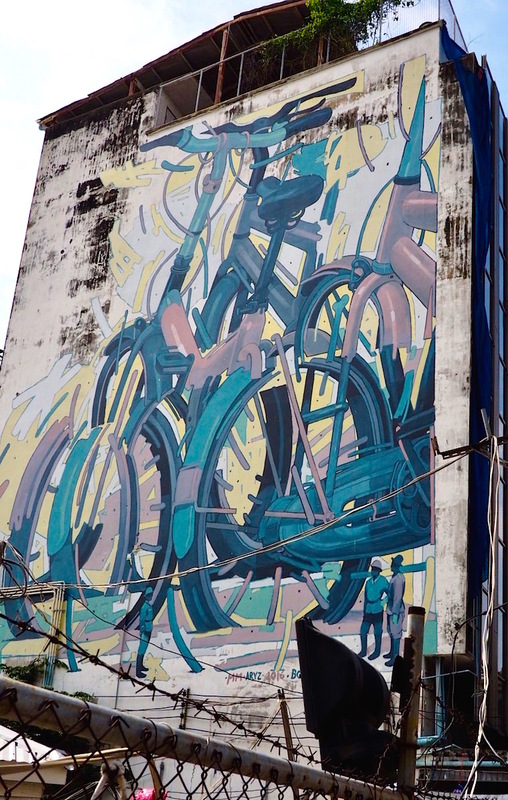 When you reach these bikes by Aryz, that’s pretty much the last mural on the map, but there’s a lot more to discover along this road. And this cute painting on the side of someone’s house. If anyone can attribute them to an artist, I’d love to know! My street art sleuthing ended there, but there were plenty more to find on the map, so if you want to see more of the excellent murals produced during BUKRUK II you’ll need to Nancy Drew them yourself. I can assure you, it’s a really fun way to explore this part of the city. Check out the BUKRUK II festival map for locations. We used a public transport app called Explore Bangkok BTS and MRT to get to Bang Rak, and then hopped on and off the ferries. But Uber is super popular too, and you can always grab a tuk-tuk if you’re happy to negotiate.